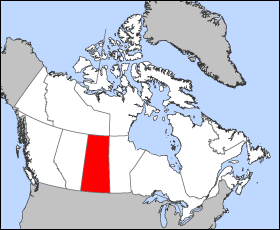 Saskatchewan is the middle province of Canada's three prairie provinces. It has an area of 651,900 km² (251,700 mi²) and a population of 978,934 (Saskatchewanians) (January 1, 2005). Most of its population lives in the southern part of the province. The largest city is Saskatoon with a metropolitan population of 225,927 (January 1, 2005), followed by the province's capital, Regina (metro population: 192,800, January 1, 2005). Other major cities (in order of size) include Prince Albert, Moose Jaw, Yorkton, Swift Current, and North Battleford. The province's name, pronounced "sus-KATCH-uh-wun" by its inhabitants, comes from the Saskatchewan River, whose name comes from its Cree designation: kisiskaciwani-sipiy, meaning "swift flowing river". 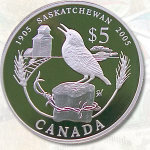 In 2005, Saskatchewan celebrated its centennial. To honour it the Royal Canadian Mint issued a coin which depicts Canada's wheat fields. Prior to European settlement, Saskatchewan was settled by Athabaskan, Algonquian, and Sioux tribes. The first European to enter Saskatchewan was Henry Kelsey in 1690, who travelled up the Saskatchewan River in hopes of trading fur with the province's indigenous peoples. The first permanent European settlement was a Hudson's Bay Company post at Cumberland House founded by Samuel Hearne in 1774. In the 1870s, the Government of Canada formed the Northwest Territories to administer the vast territory between British Columbia and Manitoba. The Government also entered into a series of numbered Treaties with the indigenous peoples of the area, which serve as the basis of the relationship between "First Nations", as they are called today, and the Crown. Soon after, the First Nations were forced onto reserves. Settlement of the province started to take off as the Canadian Pacific Railway was built in the early 1880s, and the Canadian government divided up the land by the Dominion Land Survey and gave free land to any willing settlers. The North West Mounted Police set up several posts and forts across Saskatchewan including Fort Walsh in the Cypress Hills, and Wood Mountain Post in south central Saskatchewan near the American border. Many Métis people, who had not taken Treaty, had moved to the Saskatchewan Rivers district north of present-day Saskatoon following the Red River Rebellion in Manitoba in 1870. In the early 1880s, the Canadian Government refused to hear the Metis' grievances, which stemmed from land-use issues. Finally, in 1885, the Metis, led by Louis Riel, staged the North-West Rebellion and declared a provisional government. They were defeated by a Canadian militia brought to the prairies by the new Canadian Pacific Railway. Riel surrendered and was convicted of treason in a packed Regina courtroom. He was hanged in November, 1885. As more settlers came to the prairies on the railway, the population grew and Saskatchewan officially became a province on September 1, 1905 and inauguration day was held September 4. Saskatchewan has the same form of government as the other Canadian provinces with a premier, legislature, and lieutenant-governor. For many years Saskatchewan has been one of the more left leaning provinces. In 1944 they elected Tommy Douglas Premier of the first socialist government in North America with most MLAs representing rural and small town ridings. Under his Cooperative Commonwealth Federation government Saskatchewan became the first province to have Medicare. In 1961, Douglas left provincial politics to become the first leader of the federal New Democratic Party . During the post-war period the CCF and its successor the Saskatchewan New Democrats have dominated provincial politics with Douglas, Allan Blakeney and Roy Romanow all serving long periods as Premier and becoming national figures. Urbanization since the 1960s shifted the provincial economy from an agricultural basis and there was a steady migration from farms to cities and towns. There was a corresponding shift in the NDP's focus from rural to urban concerns and the NDP gradully became the voice of cities and towns. The Saskatchewan Liberal Party was the province's main centrist party for several decades but became insignificant following the defeat of Ross Thatcher's government in 1971. The Progressive Conservatives led by Grant Devine displaced the Liberals and soundly defeated the New Democrats in 1982's "Monday Night Massacre". But its popularity plummetted after running up large deficits and being closely aligned with the Mulroney-led federal PC government in 1991. Many PC MLAs including some cabinet ministers were convicted for misappropriation of public funds and the PC Party itself went defunct. Today, the official opposition in the province is the Saskatchewan Party, a new party built out of the remains of the Tories and former Liberals. The current premier of Saskatchewan is New Democrat Lorne Calvert, whose government was re-elected in the 2003 election with a slim majority government--the NDP won 30 seats in the 58-seat Legislative Assembly, while the Saskatchewan Party won the remaining 28 seats. Most NDP MLAs represent cities and towns while most SP MLAs represent rural ridings. First Nations & Metis people are politically involved through band councils and other organizations but their representation in the provincial Legislature is very small. While Europeans are the largest number, Aboriginal peoples in Saskatchewan constitute a significant proportion of the population. Ethnicities that are neither of these two groups constitute an extremely small number. Saskatchewan's economy is traditionally associated with agriculture, however increasing diversification has meant that now agriculture, forestry, fishing and hunting together make up only 6.8% of the province's GDP. Wheat is the most familiar crop, and perhaps the one stereotypically associated with the province, but other grains like canola, flax, rye, oats and barley are also produced. Mining is also a major industry in the province, with Saskatchewan being the world leader in potash exports. In the northern part of the province, forestry is significant. Saskatchewan is also the world's most important supplier of uranium, and supplies much of the western world's supplies. The uranium industry is closely regulated by the provincial government which allows the government of Saskatchewan great latitude in setting world uranium prices. Bombardier runs the NATO Flight Training Centre in Moose Jaw. Bombardier was awarded a contract for $2.8 billion from the Federal Government for the purchase of military aircraft and the running of the training facility. This contract was made sometime between 2001 and 2002.